FIFA chief Joseph Blatter said Russia’s organizing committee and the country’s leader in person deserved five-star appraisal for the work done so far to prepare for the global event. The president of the international federation of football associations (FIFA) Joseph Blatter, is quite pleased with progress in Russia’s preparations for hosting the 2018 World Football Cup finals. At a meeting with Russian President Vladimir Putin in the southern resort of Sochi on Monday Blatter said Russia’s organizing committee and the country’s leader in person deserved five-star appraisal for the work done so far to prepare for the global event. Vladimir Putin in his turn told Blatter that Russia will not disappoint FIFA and football fans round the globe and will organize the 2018 World Cup at a decent level. "Last year we hosted the Olympic Games and Russia is now facing a grand task to prepare for the 2018 World Cup. 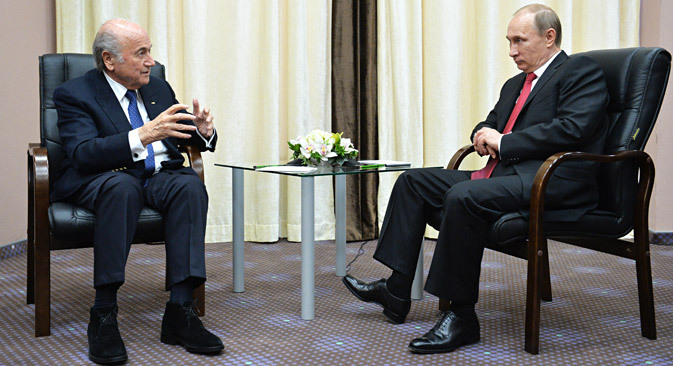 The scale of this championship is equal to the Winter Olympic Games," Putin told Blatter on the sidelines of the SportAccord Convention in Sochi. In February and March of 2014 Russia’s Black Sea resort city of Sochi hosted Winter Olympic and Paralympic Games, which, according to international sports officials, athletes and visitors, were organized at the highest level possible and provided up-to-date infrastructure at all levels as well as security for all participants in the event. "I do not know how our national [football] team will perform and we should leave this matter to specialists, but the preparations for the championship is the task of the official authorities and we will do our best not to disappoint either You, mister president, or football fans around the globe," Putin said. "Our work on preparations has already begun and it is very intense," Putin said. "Everything goes in line with the schedule." SportAccord Convention is a 6-day annual gathering of leading representatives from international sport. It encompasses the Congress and General Assemblies of three associations whose members consist of 109 International Sports Federations (IFs) and Associate Members. Russia is currently gearing up for the Preliminary Draw, which is the first major kick-off event ahead of the global tournament itself.